After high school, he enrolled in night school at the Motorcycle Mechanics Institute in Phoenix, Arizona. During the day he worked as a mechanic at Metro Motor Sports, a Phoenix motorcycle dealership. Two years later, he returned to California, working as a mechanic at Long Beach Motor Sports. He continuously participated in his own dirt bike racing activities and followed others both in Arizona and his home state. Billy’s next working venture was with Mission Yamaha, now Mission Motor Sports in Mission Viejo. During the time he was still doing “nickel racing,” he seriously began considering forming his own company. So, still in his early 20’s, he did. It was to be a specialty racing company. He would sponsor racers, serve as the pit crew and prepare bikes and entries, and provide moral and financial support. His first rider was Cassidy Anderson. His first two years were concentrated in super Moto. He’d take his portable garage to all the west coast races. “I found that the popularity of dirt bike racing was seeing tremendous growth everywhere I went. Even Anaheim’s Baseball Stadium was offering four supercross races each year. In 2002 I opened my first garage at 931 Negocio. I just worked with dirt bikes when I started. Business started going out of control. It seemed to double and triple every year,” Billy admitted. Since that time, he has added all models of motorcycles to his product inventory, including other motorized two and four wheel vehicles. Besides supporting and monitoring activities of its sponsored athletes, Nicoll Racing, including Billy and two employees, now sells special dirt bike engine parts and exhaust systems and motocross products for Honda, Yamaha, Kawasaki, and Suzuki. However, the small company services motorcycles of all types: jet skis, side-by-sides, ATVs, KTU’s, and, even smaller scooters. Additionally, Nicoll has entered the clothing business with a broad array of motocross racing apparel. 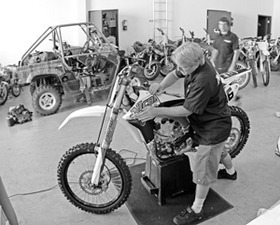 Mainly focused on motorcycle suspension alteration and motor modification, Nicoll’s repair service makes the dirt bike fit the terrain and the variables of the rides intended: dirt, mountain trails, hills, flats, sand, mud or water. Motorcycle problems are diagnosed free of charge, fixed at a fair price, and “turned around” rapidly. Bikes can be picked up and returned at no additional cost and customers are provided with a set of recommendations to customize and improve their vehicles. Along with all this, Billy Nicoll is launching a new educational venture, which has already had one successful test. A series of three-hour training sessions are in their planning stages to enable clients to better understand their own bikes, teaching them how to maintain and make necessary changes, and repair small problems on their own. The 6 to 9 pm weekly night classes cost $150. Contact Nicoll Racing, (949)218-2747; Billy_Nicoll@yahoo.com.